It’s September 1948. The curtain had come down on World War II, the airlift in Berlin was underway, and something was brewing on the Korean Peninsula that would dramatically affect our lives in the near future. The grim memories of the war were retreating to the attic of our memories; except for the few whose wounds were so deep that they would remain front and center forever. Under this backdrop, these boys of autumn assembled, and the season of ’48 began. We were anxious to prove ourselves worthy of the Red & Blue. If we didn’t know each other from the “goof squad”, we met at the two-a-days in August. Nineteen forty-eight was our year. Our fifteen minutes of fame. We were S.I. And we were going to go all the way. Football is a great, all-consuming sport. Just being on the field is exciting. There is nothing like the smell of freshly cut grass; nothing like the sound of a kick-off. The anxiety right before a play, the crash of shoulder pads, and the scrambling for the ball are all experiences non- transferable to the stands. Your eyes are fixed on the ball, your ears alert to changes in motion, the sweat and mud permeate your skin, you spit blood and mud, and, yes, you can smell a linebacker a mile away. Football demands all from your body, your heart and your wit. We were happy to comply and submit to its demands. Our coach, Mike Hemovich, whipped us into shape, bruising our bodies without bruising our spirits. A war hero, Coach Hemovich was the kind of coach who not only taught good football, but also taught good and right living. He was a nice man with nice manners. He treated us kids with respect and kindness. His stock is sorely missed today. There we were. The S. I. Wildcats Varsity Football Team. We had a good season and made it to the semi-finals. From the “goof squad” to varsity, we saw football first hand, on the field, playing and watching from the sidelines. We wore the uniform. We felt the wet earth, we heard the groans. Then we graduated. We’d return to games to see younger brothers, or just to relive our memories. Then we came to watch our sons or bring our kids to see games. It’s different in the stands than on the field. But you can still smell the grass or think you feel the gravely mud in your mouth. And you always feel the pain. It’s September 2006. The dusty streets of Baghdad headline the newscasts. A woman stands poised to become the first female Speaker of the House. And something maybe brewing, again, on the Korean Peninsula that could dramatically affect our lives or those of our children and grandchildren. On a warm, bucolic afternoon late in that September, the boys of autumn huddled once again for the first time in 58 years. There we were The Varsity Football Team of 1948, or what remained of us, regrouping on Dante Ravetti’s Hillsborough patio. We enjoyed a superb luncheon graciously hosted by Dante and his lovely wife, Terry. Certainly not the same sight as 58 years earlier, but definitely the same men. We reminisced, and thought about those who weren’t with us any longer. We commented on how well we looked and held a few more mental reservations. A good time was had by all; and at the end of the afternoon, we, then, entered into the 4th quarter of our lives. What a game!!! Above, the 1948 St. Ignatius football team. 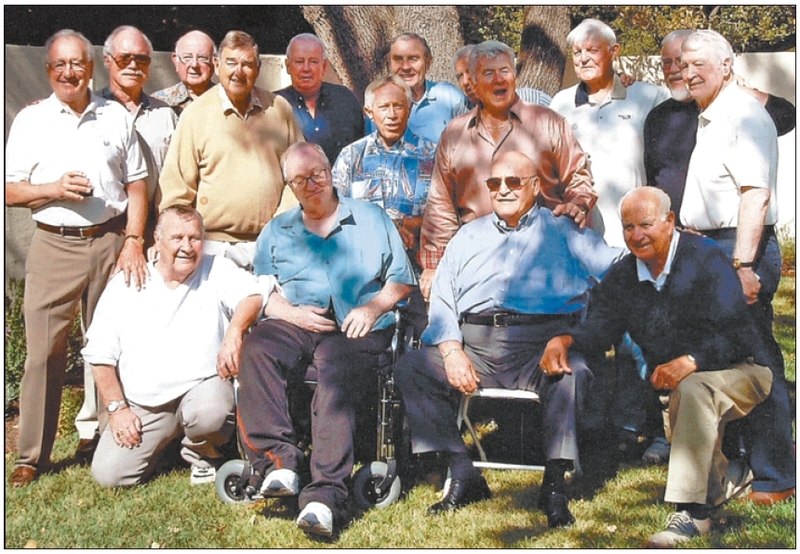 Below, in 2006, at the home of Dante and Terry Ravetti were members of St. Ignatius College Preparatory’s 1948 football team; front, from left: Bob Moore, Bill Helmer, Dan Ravetti and Laurie McCaffrey; standing, from left: Pete Arrigoni, Jack Cunningham, Bob Menicucci, Jack Mackall, Gerry Martin, Preston Lee (foreground), Gene Lynch, Pete Labrado (partially obscured), Bill Rippon, Harry Mullins, Phil O’Connor, and Tevis Martin. Thanks Donna. I know my dad loved that team and I used to wear his dirty old jersey around the yard in Bowling Green as long as I could. I don’t remember if I sent you my tribute to your dad, but I’d like to post it here on my blog. Would you mind? Thanks for reading, John.